Welcome aboard Celebrity Infinity® with her new, "Solsticized" sense of style and excitement. Relax in her spa-inspired AquaClass® accommodations featuring exclusive access to Blu, the delicious Mediterranean restaurant focused on "clean cuisine." Keep in touch at the hip Celebrity iLoungeSM where you can participate in the iLearn enrichment series or pick up the latest high-tech wonder from the first Apple® Reseller at Sea. Enjoy sweet or savory crepes at Bistro on Five. Get ready to have a uniquely unordinary dinner at the innovative Qsine® specialty restaurant, where you order from an iPad®. Finish your night with a chilled Peartini at the ice-topped Martini Bar. 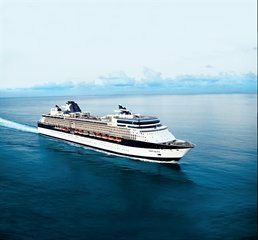 If you're ready to be impressed, Celebrity Infinity will make the most of your precious vacation days. Valencia is one of the biggest, liveliest cities in Spain. It is located at the Mediterranean sea with beaches right in its heart that offer every kind of sports. With its active nightlife and various cultural offerings, Valencia is one of the most dynamic cities in Spain. One of the most famous buildings in Valencia is the Cathedral and its tower named, "El Miquelet" (Little Michael) which was built between 1381 and 1424. Try Spain's most famous food right where it was born: "Paella Valenciana". Valencia is the city where "El Cid", Spain's national hero, fought against the Moors, and popular festivals in the city and many villages around still remind of this epoch. Alicante is located on Spain’s Costa Blanca in the Levant Region, along the country’s southeastern coast and is a tourist resort and commercial port. The region is marked by lush mountain ranges. During the Gothic era of the fifteenth through sixteenth centuries centuries, art and architecture flourished in Alicante and the remainder of the Levant Region. Immense palaces and grandiose churches were built with elaborate baroque details. Visitors can see a third century BC fortress - the citadel of Santa Bárbara built by ruler Amilcar Barca, a Carthaginian, Arrabal Roig - the old quarter, the Baroque town hall (1701-60), the Church of Santa María (14th century), and the Renaissance church of San Nicolás de Bari (18th century). Gibraltar is the famous promontory located at the western entrance of the Mediterranean, with Spain to the north and, across the Straits, Morocco to the south. The Straits are a channel connecting the Atlantic with the Mediterranean. Africa is clearly visible on a fine day. In ancient times, the Rock, as Gibraltar is popularly called, and its counterpart on the African side, Mount Abyla, were known as the Pillars of Hercules. Visitors enjoy historical sites, magnificent views and beautiful beaches. A favorite pastime is strolling along Main Street to browse and shop in the duty-free shops or stop in one of the pubs. Many visitors come to see Gibraltar's curiosity, the Barbary Apes. According to legend, the British will remain as long as the apes survive. Alemeda Botanical Gardens is where the British troops mustered for their parades. Trafalgar Cemetery was named for the casualties of the Battle of Trafalgar. On the fringe of the downtown area is the Cable Car Base Station where the car runs to the rock top. La Coruna is the largest city in Spain's Galicia region and among the country's busiest ports. Today the city's significant expansion is evident in its three distinct quarters: the Ciudad (City), and town center located along the isthmus; the business and commercial center with wide avenues and shopping streets; and the Ensanche to the South, built up with industry. La Coruna's beautiful main square, Plaza Maria Pita, has many buildings in the old section which feature characteristic glazed facades, which have earned La Coruna the name City of Crystals. Santiago de Compostela is located only 37 miles from La Coruna. The City is the original town with narrow, cobbled streets and quaint squares. Avenida de la Marina, running parallel to the waterfront, is lined by typical tall houses with glazed balconies at every floor. Mendez Nunez Gardens lie between the harbor and Los Cantones in a bustling quarter of the city. Once used as a prison, San Anton Castle now houses the Military and Archaeological Museum. The Roman lighthouse Hercules Tower is said to be the oldest in Europe. Rates are cruise only, per person, based on double occupancy. Taxes, Fees and Port Expenses of $123.36 additional for all guests. Rates are subject to availability and may change without notice. Restrictions may apply.